in the Configuration Manager. The configuration requires you to select a target CRM, specify events that trigger screen population of CRM records, and specify popup window properties in the Configuration Manager. 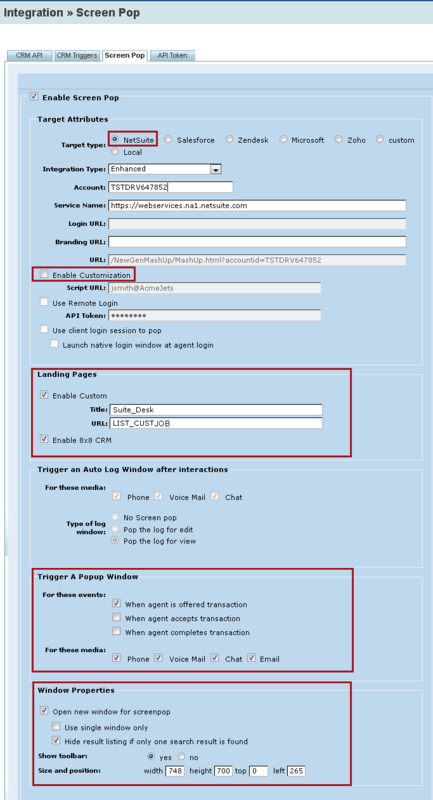 An agent must then save the login credentials of the external CRM account in the agent’s profile. Integration enables searching for records containing phone data matching caller ID, and pops up the corresponding record(s) for specific events. If the search retrieves multiple records, the screen pop lists all matches in a table, and displays the details of the first record. If the search fails to find matching records, then pops a blank record to create a new customer record, a case, or a new contact. The integration now supports automatic generation of call logs, chat logs, and email logs for all inbound as well as outbound transactions. An Auto Log is a record that automatically logs transaction details of all interactions across all media and relates to an appropriate object. For example, a call log includes information such as call duration, call answered time, call hang-up time, transaction ID, and call type. An auto log generates automatically at the end of post processing of a transaction. An inbound auto log automatically associates with a matching contact record provided the contact is associated with a company, while an outbound auto log creates an independent task. Note: If a contact record is not linked to a company, the inbound call log will not be associated with the contact record. The log saves as a stand-alone phone call/task. Navigate to Integration > Screen Pop tab in the Configuration Manager. Select Enable Screen Pop check box. 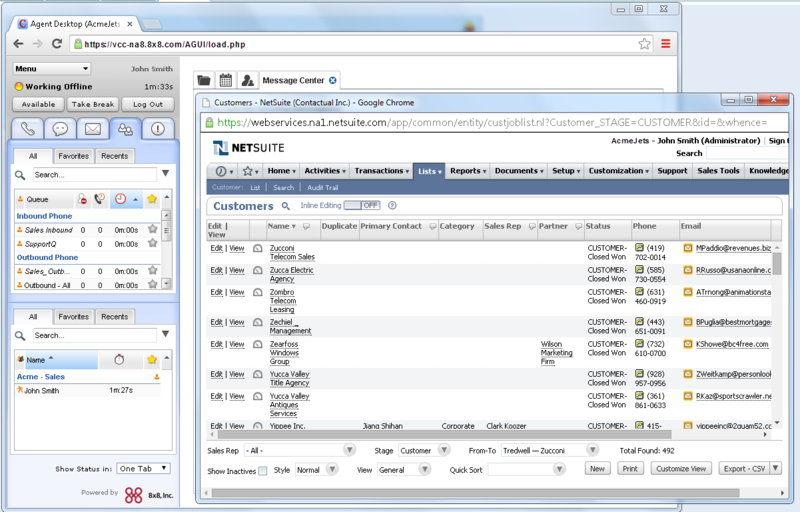 Select NetSuite as your Target Type. Enter the Account information. The Account refers to your NetSuite account ID accessible to you if you are an administrator, for example: QSDERF115234. Log in as NetSuite Administrator. 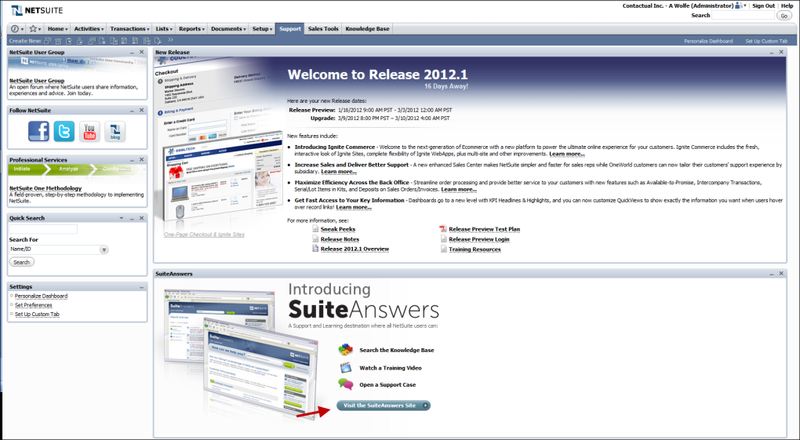 Click the Go to SuiteAnswers button under SuiteAnswers. Click the Contact Support by Phonebutton to view the Account ID. This option instructs a tenant to execute a custom XML script for NetSuite integration. If customization is enabled, the Script URL must contain a valid URL that points to the location of the custom script. Once the Script URL is specified and the screen pop page is saved, all features and functionality of the standard integration are replaced with the custom functionality. Agents see the changes with their next login. Title—A name to show on the custom tab, for example: My SalesSuite. URL—The landing URL which launches when agent logs in to Agent Console. Enter LIST_CUSTJOB in this field to launch Customers Lists page. 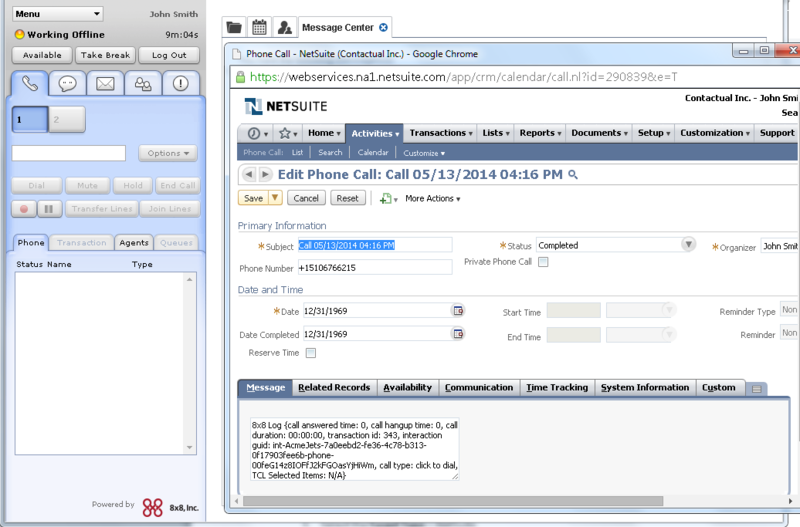 Modify this link to point to any other location within NetSuite. Enable 8x8 CRM—Allows access to the Virtual Contact Center CRM by opening Cases, Customers, and Tasks tabs. 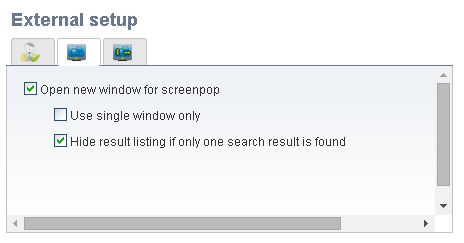 Under Window Properties, check the option to open a new window for screenpop, and specify its size and position. Note: Failing to check this option results in an error while launching NetSuite from Agent Console. For security reasons, NetSuite does not support display within the iFrame. Learn more about how to control properties of a screen pop window. This option allows agents to view landing page and screen pop of interactions in a standalone pop up window. If disabled, prompts you to open a new window for landing page. If an interaction is connected to multiple records, a tab opens listing all matching records with the first record details displayed in a new window. You can click on a record to view the record details. Use single window only: This option displays the screen pop in a new window and refreshes the same window to show new contact and call log information. If screen pop is triggered for multiple events, the window refreshes for each event. If disabled, launches multiple windows for each triggered event. Hide result listing for single search result: If an interaction fetches multiple matching records, a browser window lists all matching records in a tabular format. Clicking on a record shows the record details. 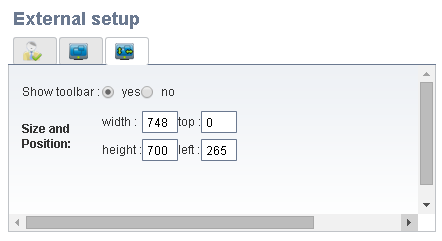 Specify exact dimensions of the screen pop window and its position on the screen. Note: The configuration of Screen Pop window properties may be controlled by agents from the Agent Console if the administrator extends this capability to agents. With the screen pop configuration in the Configuration Manager complete, you are now ready to set up the Agent Console for integration. Agents already logged in have to log out and log back in to benefit from the configuration change. 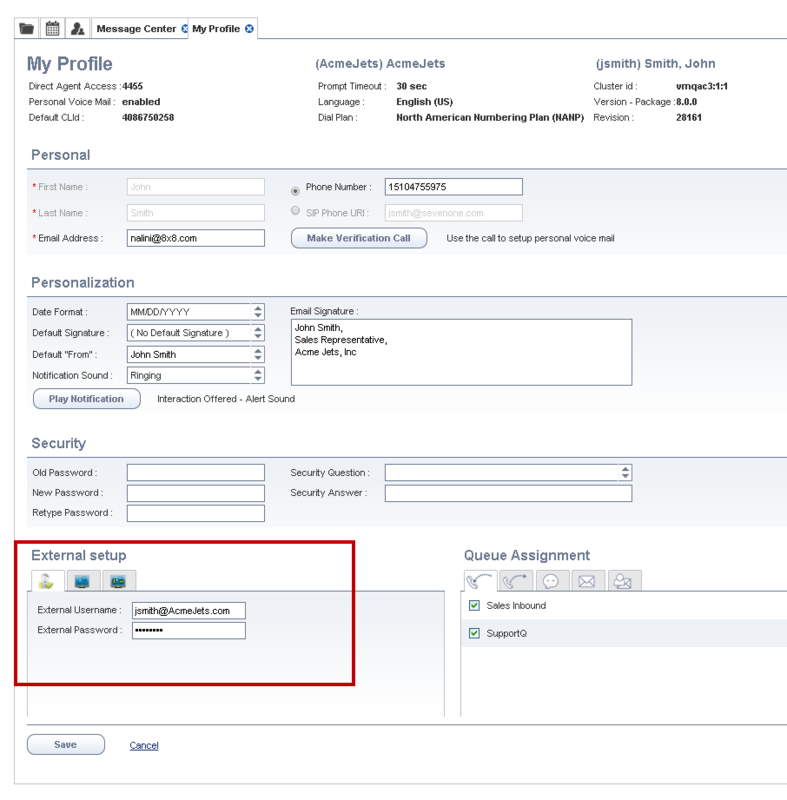 An agent has to save the NetSuite account username and password in the profile for accessing the integrated Agent Console. Log in to your Agent Console, and navigate to My Profile. Scroll down to the External Setup. 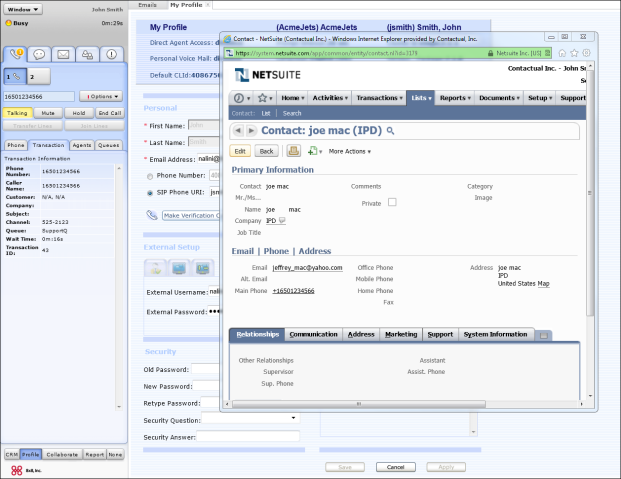 Enter your NetSuite account login ID and password in the Authentication tab. Note: If your external password contains special characters, the integration fails. Please reset the NetSuite account password to exclude any special character. In the Screen Properties tab, check the option to open a new window for screen pop. Save your settings. You are automatically signed into your NetSuite account. Based on the settings, when an incoming call, or chat, or an email is offered/accepted/completed, the matching record/s pop in the NetSuite browser instance. External Username/Password is empty or incorrect. The External Password value in the Agent Console profile contains special characters. Reset the NetSuite account password to exclude special characters. Enter the reset password as the External Password in the Agent Console profile. The NetSuite user role is denied access to web services. Contact your NetSuite Administrator to grant access to web services to the role.